The Carlyle Fraser Library is proud to announce our first video production entitled, The Day of the Relevant Library: You Are What You Consume, a fun filled adventure featuring Westminster's mascot, The Wildcat, encountering and overcoming a perilous zombie horde with the help of the library. 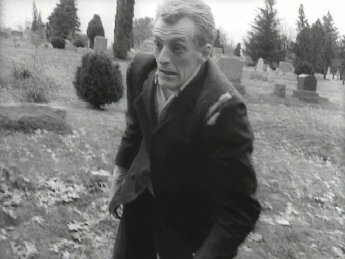 The above image is from The Night of the Living Dead. Somehow I just knew that was Barker in the cat costume. Some people's mannerisms will show through any disguise. And very impressive that you got Chris Bishop to play the part of all those zombies. On a more serious note, I highly recommend World War Z. Written in a journalistic style reminiscent of the late Studs Terkel, it's packed full of incisive cultural and political commentary . . . and zombies.